WJC President Ronald S. Lauder blasts European Parliament for hosting convicted Palestinian Arab terrorist Leila Khaled. Ronald S. Lauder, President of the World Jewish Congress (WJC), on Friday sharply criticized the European Parliament for hosting Leila Khaled, a convicted Palestinian Arab terrorist who continues to advocate violence against Israelis. Khaled is also scheduled to speak in Spain at the publicly funded University of Madrid on September 30 and at the Madrid city council’s municipal auditorium on October 2. 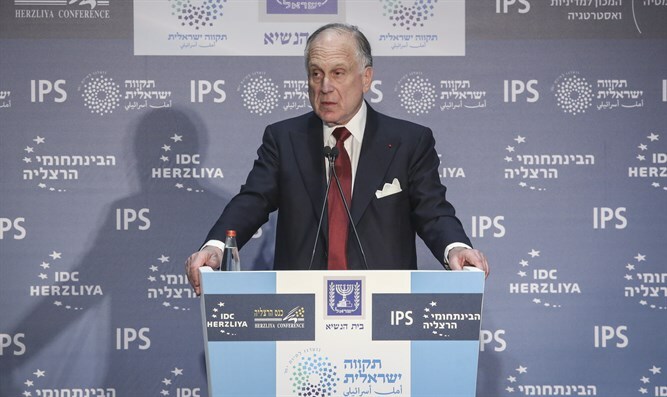 “Usually, government agencies – especially in Europe these days – work hard to keep out known terrorists, and the last thing they would consider is giving terrorists’ voices an official forum,” said Lauder. “It’s hard to imagine that a terrorist who had targeted any country other than Israel would be extended a similar invitation – and I strongly urge other countries not to engage in such hypocrisy. Giving Khaled a platform legitimizes terrorism and undermines the peace process,” he added. Lauder expressed profound disappointment that apparently, no one in the audience protested against Khaled’s assertion that Israel was worse than the Nazis. Khaled was the keynote speaker at an event on Palestinian women’s resistance Tuesday night at the European Parliament in Brussels. Khaled was arrested carrying two grenades by Israeli sky marshals in 1970 while attempting to hijack an El Al flight from Amsterdam with a partner, whom the security officers killed. British authorities released her in exchange for hostages from another hijacking a month after her arrest. She had already hijacked an American passenger plane in 1969, landing it in Damascus, where the two Israeli passengers aboard were arrested for three months before they were traded for Syrian prisoners of war in Israeli jails.